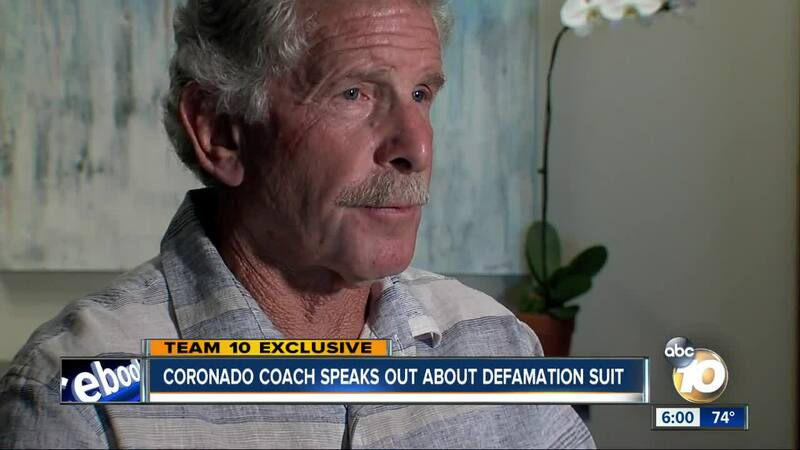 CORONADO, Calif. (KGTV) - 10News has an exclusive interview with the Coronado water polo coach who was accused of molesting a former middle school student. 10News Investigative Reporter Jennifer Kastner sat down with Coach Randy Burgess this week to talk about how he’s filed a new defamation lawsuit against the local school district. Burgess is now back to coaching at Coronado High School, but he’s suing Coronado Unified School District for libel. He says officials did a great deal of harm to his reputation with how they handled the allegations of sexual abuse. “[The statement] implies that he is a danger to students [and] that he is a child molester or may be a child molester,” says attorney Matthew Herron. Several news outlets, including 10News, published reports. His accuser’s original claim with the district alleges that Burgess hugged, kissed and eventually raped the teen. The district put Burgess on paid leave before denying the claim. The DA’s Office declined to prosecute. Herron says the district denied the claim, knowing it was false, but still kept the coach off-campus for months while it waited to see if the accuser would file a civil suit. That timed out. “As soon as the calendar ran up and the claim would not be filed, I was reinstated,” says Burgess. The district sent him a letter notifying him that he was expected to return to work as a physical education teacher. “[The district] didn’t exonerate him and didn’t take back the statement that he was a danger to students,” explains Herron. He adds that the district also didn’t say anything about the supposed investigation. While Burgess is relieved to be back to work, he tells us his name will forever be associated with the accusations. He believes that the district is, in part, to blame.